TTMAC head office to review the new terrazzo samples will prove this. From bright lime green to subtle beige with mother of pearl chips, the combination of colours and aggregates is, in fact, limitless. Many of our first encounters with these products have been in schools and hospitals where the colours and patterns have been monochromatic and plain. Terrazzo was used in these applications because of its durability and price. As labour prices increased and tile technology developed, terrazzo was slowly replaced by ceramic tiles and sheet flooring. For reasons outlined below, terrazzo has recently experienced a renaissance and has embraced its artistic beginnings. Those artistic beginnings can be seen on a trip to Venice, which will reveal countless terrazzo masterpieces. Many of these applications are underwater for many weeks during the year due to the regular floods that the city experiences. Yet these floors are as beautiful as the day they were installed. Terrazzo was developed in northern Italy in the province of Friuli in the 1500s. People gathered river stones and cemented them together on their floors. Higher stones were ground down to prevent tripping. The grinding process (manual in those days) revealed a beautiful pattern and highly durable floors. In those Venice masterpieces, leftover or broken pieces of marble used in flooring and cladding projects would be used to make the terrazzo. This type of terrazzo is known as Veneziano terrazzo. Most of the polishing was completed by prisoners and they would use a term, Galero, which means jailer in Italian. 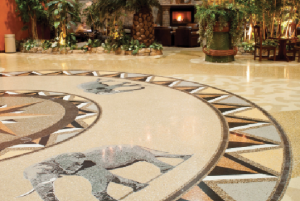 This terrazzo floor at the Kalahari Resort in Wisconin Dells, Wis., contains stunning life-sized images of animals co-existing with their natural exotic habitat. The floor was installed over an existing stained concrete floor and features over 40 colours of tinted resin combined with marble aggregates, clear resin, torpedo sand and mother-of-pearl. Terrazzo became commonplace once electric grinding machines were developed in the late 1920s. Cement terrazzo is coloured using pigments. 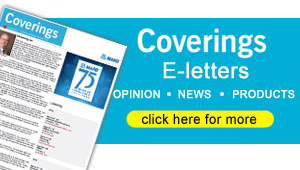 Mixing the pigments constantly for large applications can be very challenging. Cement terrazzo does allow for the use of very large aggregates called chips and can be poured to from 20 mm to 100 mm in thickness. Terrazzo’s next big developmental step was the epoxy resin in the 1960s. Epoxy was an alternate matrix to cement. As solvent-free technologies developed, epoxy terrazzo became more user-friendly, so the majority of terrazzo being installed currently is epoxy. Epoxy terrazzo can be formulated to match any paint chip colour, from bright reds to deep blacks. The mix is formulated in the factory and assures consistency. Epoxy terrazzo is typically poured to a thickness of only 10 mm, which limits the size of the chips that can be used. Various chips have been developed over the years, including mirror, glass, metal, and plastic, all of which can frequently be found and used in modern terrazzo. Terrazzo has evolved again and is now being used as an artistic finish in many public spaces. You will find a terrazzo river flowing down the atrium of a hospital. As it travels through the hospital, you will see it experience the change in seasons with blooming flowers, and fallen leaves. You will also find a map of the world completed in terrazzo at the base of the CN Tower to show exactly where you are in the world. The possible combinations of colours, patterns and chips are limitless. Glen Pestrin is c.e.o. of York Marble in Toronto, Ont.